In keeping with the project’s original intent-- student apprentices and professional artist’s working together for the advancement of community spirit and a “Better Boyertown ,” five fifth grade students from Washington Elementary School were selected to be part of the artistic team. Kareem Borowy, Michael Hess, Miranda Kerver, Stephanie Mathias and Linsey Stoffle t met several times daily for eight full weeks to work on “George Washington Bear .” This ‘get the job done’ group set a March 16 th deadline for the completion of George, as he affectionately came to be known, with the official debut to take place at the annual art show. Work sessions took place before and after school and at recess, whenever the students wished. Parents and grandparents often dropped off the students early to school. On January 13 th I was standing in the lobby of Washington school looking at an overcast sky thinking the rain would never stop. In what seemed like pure fate, came a big, white bear on the back of a pickup truck. It sped right past the front door and around the bus loop. Out of the truck popped Paul Stahl, who had delivered George to our school between downpours under an overcast sky. George was finally home and the news spread like wildfire. By three o’clock in the afternoon there was no containing Team Washington. So we got started. Understanding the arts in education requires art educators to present ideas/concepts in a big way, providing the broadest views for our youngest students. Since the Washington Elementary students range in age from five to twelve, patriotism became a broad substitute for spirit, a seemingly reasonable idea given what the students have observed on the national and international stage in recent years. George Washington Bear represents the strength of our country, the freedom we all share and sometimes are asked to defend. Art reflects the essence of human experience. Producing art is an entirely different process from understanding art. Tile making began in late November, early December. The team met in the art room at the end of day and each child rolled a flat of tiles every day except Friday. In the morning, before school, the tiles from the previous day were glazed or stained. At recess, the team placed the tiles on kiln shelves, and the kiln was loaded and fired almost daily. Production of tiles in this fashion continued until Christmas. 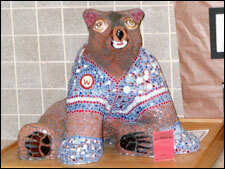 By the time George arrived in January, an estimated two hundred pounds of tiles were made. Tiling began at the bottom of the form with the brown tiles used as the mastery element. By the time the expansive brown area was complete , the students had enough experience to fill the sweater or torso of the form with full creative freedom. 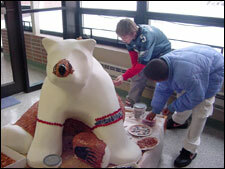 The torso was divided into five equal sections, one for each student. 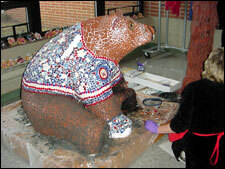 They worked diligently until the entire bear was embellished ; at times they helped one another, and sometimes they worked on a foot or a border instead. Upon completion of tiling, I grouted the seams and the team bathed George daily until the grout haze vanished. 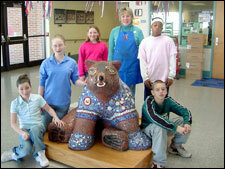 The bear was moved to the main lobby by all five teammates. On the left cheek there is a little red tile in the shape of a hear t; this marks the spot were George received his first kiss from a first grader. The children often requested to take George out to recess and they often fed him tiny tiles when I wasn’t around. In the evening when they weren’t around, I would remove the tiny tiles with a tweezers. I had to remember that to them, George is real. As a matter of fact one child pretended to be a bear everyday before moving down the hall. Others greeted George daily and engaged in rather in-depth conversations with George. Fortunately, George never answered aloud.